The chief concern listed by the most companies (29% to be exact) was Reducing Travel and Expense Costs, and this is not a big surprise. 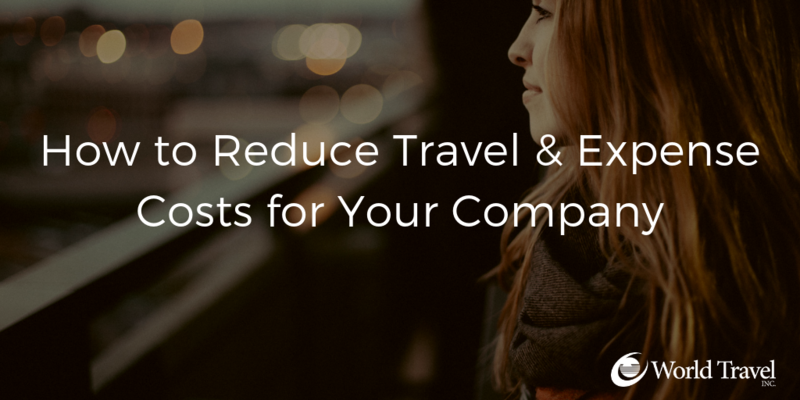 Finding opportunities and strategies to lower overall travel spend can save your company money very quickly. But how do you identify what is currently driving up costs for your travel program? Better yet, what specific strategies can you implement to reduce costs? World Travel, Inc. experts weighed in on this topic to provide the strategies listed below. If your car, hotel, and/or airline contracts have not been negotiated, doing so could be a huge savings opportunity for your company. The ideal TMC will negotiate any applicable contracts on your behalf to ensure that your program is taking full advantage of the discounts available to you based on volume and market share. At World Travel, our Consulting Services department works with you to optimize supplier agreements and oversee annual negotiations and RFPs to bring more value to your travel program. As the hotel RFP season begins, World Travel will also be hosting a webinar with IHG to share specific strategies for negotiating hotel contracts. To sign up or learn more, click here. Another way to reduce travel costs is to reign in rogue travelers. If your travelers are booking direct as opposed to booking through your agency of record, especially if you have negotiated rates through your TMC, what they think is a “better deal” could end up costing you more. When it comes to increasing traveler compliance, you can implement soft-sell strategies, i.e. gamification, advertising, optimization of the online booking tool, or requesting a reason at the time of booking for out-of-policy reservations. You can also take a stricter approach with no-nonsense solutions, such as hard-stop approvals, mandating, or withholding reimbursement. The real question is what have you tried already, and what are you willing to try as a company to increase compliance? World Travel can work with you to determine a plan of action moving forward. If most of your travelers are booking through an agent as opposed to through an online booking tool, this may be driving up costs as well, as agent-assisted bookings usually require a higher service fee. Encouraging travelers to book online will save you money and provide program flexibility. Most of our clients use a combination of online and traditional reservation methods that suits the needs of their business and their travelers. Haven’t implemented an online booking tool for your travel program yet? We can help you determine which is the right choice for your company. A sure-fire way to reduce travel costs is to minimize last-minute bookings, but how far in advance is best? Having an underdeveloped travel policy can certainly cause higher travel and expense costs, as it is difficult for a traveler to comply with rules that are neither clear nor descript. Need assistance beefing up your policy, communicating it to your travelers, or making sure your online booking tool is optimized to best support your program goals? World Travel can help. Depending on your travel-arrangements turnover, unused tickets could be the untapped treasure trove of your program. Your TMC should be able to assist you in increasing redemption of unused tickets through automated processes, reminders, and reporting. For example, are your travelers receiving alerts and notifications that unused tickets are redeemable? Are you as the travel manager / procurement officer receiving unused ticket reports on a consistent basis? World Travel supports all the above through technology and manual processes to ensure our clients are redeeming unused tickets before they expire. Finally, you can encourage your frequent travelers to sign up for rewards programs. While frequent flyer miles are the most popular, these are often earned through credit card purchases and depending the card’s terms and conditions, travelers may accumulate points for seat upgrades, faster check-in times, and luggage allowances. Other travel suppliers’ rewards programs could offer discounts, location-based complimentary experiences, points redeemable within their brand, etc. Your TMC should ensure that your travelers’ rewards programs are applied at the time of booking. World Travel makes sure rewards programs are accessed when applicable regardless of whether your travelers are booking online or through an agent. Still not sure what is driving up costs for your travel program or where to start? World Travel, Inc. team members will gladly talk through it with you and help you identify opportunities to reduce costs for travel program. Contact your World Travel, Inc. Account Manager or reach out to our sales team at sales@worldtravelinc.com. As promised, we will continue to deliver valuable information and blog articles on the topics that are the most important to you. In our next article, we will discuss how to utilize innovative travel technology to improve your program – stay tuned!